John Carter's quest for box office sales didn't pan out, and Disney's film boss Rich Ross is paying the price. NEW YORK (CNNMoney) -- The titular hero in the sci-fi epic "John Carter" slayed evil aliens, decimated enemy armies -- and now, he's killed Rich Ross' position as chairman at Walt Disney Studios. 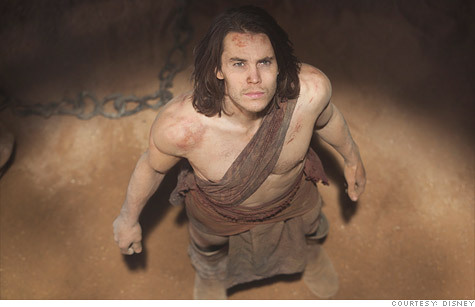 Disney (DIS, Fortune 500) released the movie "John Carter," based on a Martian adventure novel by Edgar Rice Burroughs, to theaters on March 9. The studio placed a huge bet on the sci-fi extravaganza. Box Office Mojo estimates the movie cost $250 million to make, and the studio spent heavily to market it. But box office sales were so weak that just 11 days later, on March 20, Disney made a dismal announcement: The company would lose $200 million on "John Carter" in its fiscal second quarter, which ended March 31. The debacle was enough to end the Disney film boss' run. On Friday -- exactly one month after the $200 million loss announcement -- Rich Ross resigned his post as chairman of Walt Disney Studios. "I believe in our strong slate of films and our ability to make and market them better than anyone else," Ross wrote in his resignation letter. "But, I no longer believe the Chairman role is the right professional fit for me." Ross had been at Disney for 15 years, and he signed onto the chairman role in late 2009. Disney did not name a successor in its announcement, but issued a short statement from CEO Bob Iger wishing Ross well. Related story: Can Netflix pull a rabbit out of its hat? The "John Carter" flop was a sharp blow to the struggling film industry, which saw ticket sales dip to a 16-year low in 2011. But the rest of the 2012 slate looks more promising: widely anticipated titles include Disney's own "The Avengers" as well as "The Dark Knight Rises" from Warner Bros. (which is owned by CNNMoney parent company Time Warner (TWX, Fortune 500)). Lionsgate (LGF) has already scored a massive hit this year with "The Hunger Games," which debuted in March, and the studio will release the final "Twilight" movie in November.